Saturday, September 6, 11:00 a.m. - 3:00 p.m.
Jackson House, 76 Northwest Street, Portsmouth, N.H. 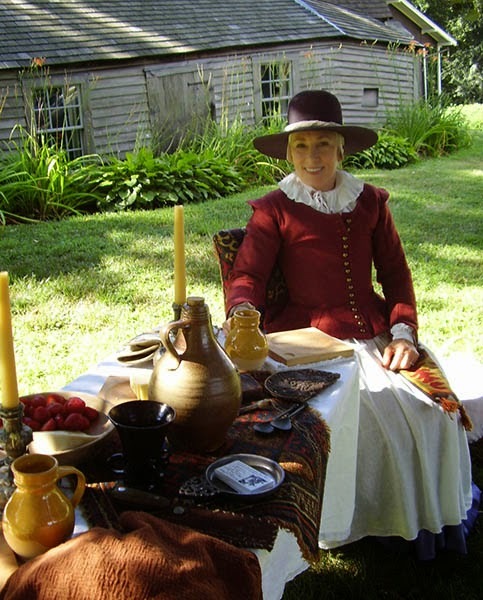 The historic orchard of the c. 1664 Jackson House comes alive during this early fall festival with music, children's games, crafts, and seasonal refreshments. Help grind apples and press cider. Watch artisans demonstrate their craft. Tour the oldest house in northern New England. Farm animals from Spencer-Peirce-Little Farm will also make their yearly visit to the house. PORTSMOUTH — Just off Maplewood Avenue sits the oldest existing wood-frame house in all of New Hampshire and Maine, overlooking a fragrant apple orchard. The Jackson House (circa 1664) was built by Richard Jackson, a woodworker, farmer and mariner. "They called those who built houses 'housewrights' back then," said Kathy Somssich, who is in her 14th year as a guide for the house overseen by Historic New England. "Seven generations of the Jackson family lived in this house." Each September since 1995, the Jackson House has hosted a harvest festival in the orchard that slopes down to the outlet of North Mill Pond into the Piscataqua River. This year's event will be held from 11 a.m. to 3 p.m. Saturday, Sept. 6.